Typically, you use an IPSec subnet VPN to create a secure, encrypted tunnel between subnets, such as between two Smoothwall appliances located at a head office and a branch. However, the Smoothwall can operate in IPSec NAT Traversal (NAT-T) mode. NAT-T uses the UDP Protocol instead of Protocol 50 for IPSec VPN traffic – UDP is not affected by the NAT process. Note: Any IPSec VPN client connections from a local network behind the Smoothwall that connect to another vendor's VPN gateway will also need to use NAT-T rather than Protocol 50 for the reasons stated above. 1. From the primary Smoothwall, create a local Certificate Authority — see Creating a Certificate Authority . 2. From the primary Smoothwall, create certificates for the primary Smoothwall, and remote appliances, including non-Smoothwall appliances — see Managing Certificates . 3. Set the default local certificate for the primary Smoothwall — see Setting the Default Local Certificate . 4. From the primary Smoothwall that points to the remote host, go to Network > VPN > IPSec subnets. Allows the user to specify a custom certificate subject string that it should expect the remote gateway to present as ID (typically used for non-Smoothwall VPN gateways). Note: Typically, advanced settings are used for compatibility with other VPN gateway systems, although they can be tweaked for performance gains in Smoothwall to Smoothwall VPN connections. • Local internet IP — Optionally, enter the IP address of the network to use when the Smoothwall itself sends traffic in the tunnel. Note: Many parameters are used when creating an IPSec site-to-site VPN tunnel. 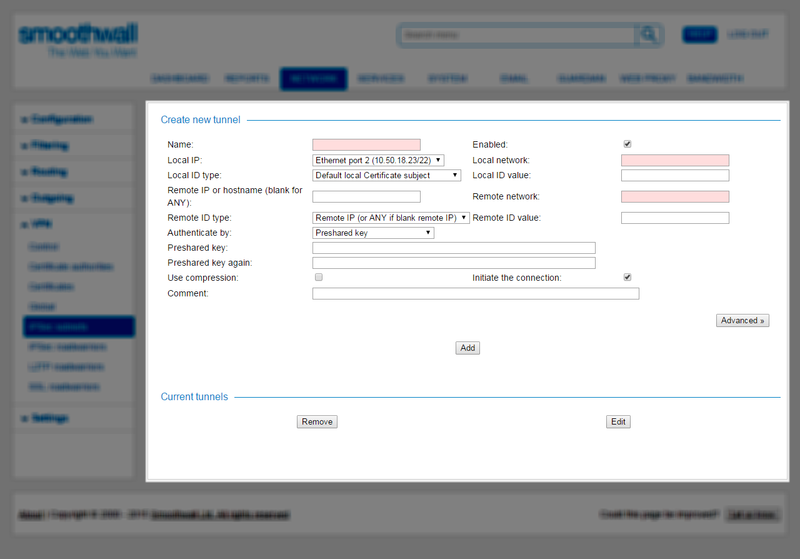 For Smoothwall to Smoothwall connections, many settings can be left at their default values. 11. From the remote host, import and install the Smoothwall’s certificate exported in step 9. For a detailed description of how to import Certificate Authorities, see Importing a Certificate. 12. From the remote host, create a tunnel using the same settings as configured on the primary Smoothwall. If the remote host is another Smoothwall system, repeat steps 4 to 8, but on the remote host. If the remote host is a Smoothwall system, go to Network > VPN > Control, else skip to step 16. This example explains how to create a site-to-site IPSec tunnel using X509 authentication between two Smoothwalls. Its value is automatically retrieved by the Smoothwall during the connection process. From the drop-down list, select Certificate provided by peer. This will instruct the Smoothwall to authenticate the secondary system by validating the certificate it presents as its identity credentials. Do not select. It is the responsibility of all secondary systems to initiate their own connection to the primary Smoothwall system. This instructs the Smoothwall to authenticate the primary system by validating the certificate it presents as its identity credentials. Select as the secondary system is responsible for its connection to the primary Smoothwall. From the drop-down list, select Preshared Key. This will instruct the Smoothwallto authenticate the secondary system by validating a shared pass phrase. Do not select this option. It is the responsibility of all secondary systems to initiate their own connection to the primary Smoothwall. 2. Click Add. All advanced settings can be safely left at their defaults. The Smoothwall lists it in the Current tunnels area. The next step is to create a matching tunnel specification on the remote system. From the drop-down list, select Preshared Key. This will instruct the Smoothwall to authenticate the secondary system by validating a shared pass-phrase. Select this option as it is the responsibility of the secondary system to initiate its connection to the primary Smoothwall.